MGI will give the new AlphaJET digital hybrid printing and embellishment system its debut at the All4Pack 2018 show in Paris. Incorporating water-based Memjet printing technology with UV white ink and clear varnish, the B1 press has been designed to allow printers and converters to maximise profitability and capture new opportunities in the high-growth packaging sector. The company stated that its product development focus for the AlphaJET is to consolidate the functionality of traditionally separate, disconnected operational workflows, such as primer coating, printing and embellishment and converting, into a single combined 'all-in-one' industrial print factory for complete job management. 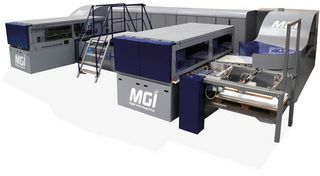 Marking the start of a new partnership between MGI and Memjet, the system uses Duralink ink modules and printheads for CMYK colour impressions in a resolution of 1600dpi at a speed of 1800 B1 sheets per hour. As with MGI's other systems, inline embellishments with white UV ink and clear varnish enables tactile embellishment and embossing as well as foiling. The AlphaJET's substrate management capabilities include folding carton, corrugated board, plastic and synthetic substrates, and other speciality stocks and rigid materials, such as wood, metal and glass. It features a circular transport carousel with an intelligent tray feeding system for multi-directional ink application to optimise print quality. The motorised electro-magnetic conveyer rails and intelligent AIS Smartscanner software provide accurate print registration within a tolerance of 5 microns. Other expansion capabilities include implementation of printed electronic circuitry applications, such as chipless RFID/NFC antennas and OLED flexible screen technology. The committee of judges has awarded MGI with the All4Pack Innovation Award 2018 for the new system.